Life on the road has changed in so many ways over the last 30 to 40 years. Linda Lee Rathbun compares her early days of travelling Australia to what it’s like now. One of the pools at Gunlom, Kakadu. Australia has bewitched us for over 40 years. We arrived in 1977 as young immigrants from the United States, Steve as a teacher and I as his accomplice. It wasn’t long before school holidays were occupied with camping trips. In those days you could simply rock up to Wilsons Prom over the Easter break and get a site with no trouble. Early on, we rented a campervan in Perth during a two-week break. We had heard of a place called Monkey Mia where wild dolphins followed fishing boats around hoping for a handout. Soon after the turn-off to Shark Bay, the road became unsealed, sending the contents of the camper into seizures, with cupboards threatening to fall to the floor as we bumped over the corrugations for hours until we finally reached Monkey Mia. A basic campground with saltwater showers greeted us; several graduate students were there studying the dolphins and we freely roamed the beach while dolphins slowly followed us up and down the shoreline. Monkey Mia was once a secluded, quiet place where dolphins would follow visitors along the shoreline. The caravan park was almost empty, with only a few tents and campers set-up above the beach. Fast forward 20 years to another visit when the road was sealed, the caravan park was now the Monkey Mia Dolphin Resort where a jam-packed campground offered freshwater showers, trendy coffees, ranger-managed dolphin encounters for exhausted tourists on day trips from Perth, and numerous boat tours on Shark Bay. Some would say better; some would say not. Our first long tour (six months) of Australia was in 1980. We set off with two other teachers, the roof rack of our Toyota Land Cruiser groaning with enough canned hams to feed an army. In those days, your choice of camper trailers was limited, with no offroad options. Our friends had a Petersville Bushwacker and we had a Coleman tent. An empty Great Ocean Road led us from Melbourne to Adelaide via the Coorong, where we camped on abandoned beaches dotted with fishing shacks and no one to tell us we should not be there. In Port Augusta, the Stuart Highway became unsealed and stayed unsealed all the way to Alice Springs. The turn-off to Uluru, called Ayers Rock back then, led us along a dusty dirt track that, in an impending rain storm, turned to red mud. As we drove, we could see the Bushwacker fishtailing wildly in the rearview mirror. The campground was at the base of the rock with a couple of daggy motels, a shop, and an array of humpies where the traditional Aboriginal owners of the rock lived. Beautiful Aboriginal children would join us in the morning to skip rope (for fitness), patting our pockets and asking for lollies. There was no one to say we shouldn’t climb the rock, and so we did with no one else on the way up or down (out of respect for the owners, we never climbed again). 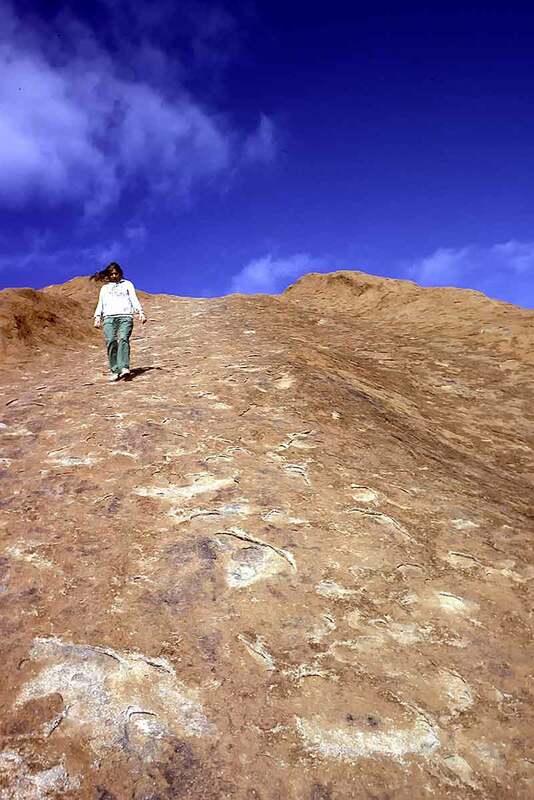 The red, dirt track leading out to ‘the Olgas’ was a journey of its own. Today, Uluru and Kata-Tjuta have been returned to their rightful owners who live in a community inaccessible to tourists. Yulara is a slick tourist operation and the national park is carefully managed with a viewing area at both locations where the sunsets scald a sky fading to lavender. Every year, 60,000 visitors climb the rock, ignoring the wishes of the owners – in October 2019, the climb will be banned. Better, most certainly, but certainly no longer an adventure. Later, we arrived at Kakadu. I think the campground was in Jabiru; I remember showering with a mob of mosquitos feasting on my flesh. We had heard there was rock art in the area and someone in the pub drew us a mud map, telling us to follow a number of tracks that were no more than indentations in the dirt. We got lost, but eventually found what is now Ubirr where we lay under rocky overhangs and wandered without fences or signs, in awe of the stunning panels of art. Today, everything is fenced and signed; more informative yes, better protected certainly, but never again as it was. We drove out to UDB Falls (now called Gunlom Falls) where a sign told us not to stop as the area had detectable radioactivity. The Jawoyn people called this Buladjang, sickness country, and a direct connection has been established between Bula sites and uranium deposits.No one else was within cooee of Gunlom Falls and its plunge pools. In 2017, another visit to Gunlom had us hurtling along a track so badly damaged it was treacherous. Vehicles in front of us tossed up rocks and a blinding curtain of dust, vehicles behind us did the same to those behind them and a parade of oncoming 4WDs barely kept to their side of the track. Frankly, I was terrified. The parking lot at Gunlom was as jam-packed as a mall on Christmas Eve and the plunge pools were full of bobbling visitors. My advice to all: do not visit Gunlom over a long weekend or during school holidays. Queensland has seen the most changes, I think. In 1980, there was nothing in Port Douglas but a pier, a pub and a pizza parlour. Land was cheap as chips and there were no boat tours out to the reef. We bush-camped at Cape Tribulation without another soul in sight the entire time we were there. Cape Tribulation, Qld, was once a place where one could bush-camp without another soul in sight. We gathered oysters from the rocks and found a macadamia tree heavy with nuts. We bathed, repeatedly, in a creek long before we had enough awareness of estuarine crocodiles to realise how stupidly we had exposed ourselves to death by croc. Cairns was a remote village with few facilities and minimal tourism. Travelling on the Bruce Highway, there was always an excellent chance of getting stuck behind a circa 1970s Viscount caravan bumping its way along behind a Holden Kingswood at about 50km/h with few chances to pass on the narrow, winding, pot-hole-riddled road that is still frustrating to this day, but a vast improvement over what it was. Later in the 1980s, Tassie became our favourite destination during the longer, summer school holidays. At Cradle Mountain, a campground was set up below Waldheim Chalet and most evenings we were treated to visits by spotted quolls, wallabies and wombats; in those days about 25,000 people a year visited Cradle and only a few of those camped. One year, as a treat, we took a ride to Pencil Pine Lodge (now Cradle Mountain Lodge) for a Christmas roast dinner, then a single building with a few rooms upstairs and a campground near the parking lot. The lodge only accepted cash, which we didn’t have on us, so they told us to just mail the money next time we had the chance, and that we did. 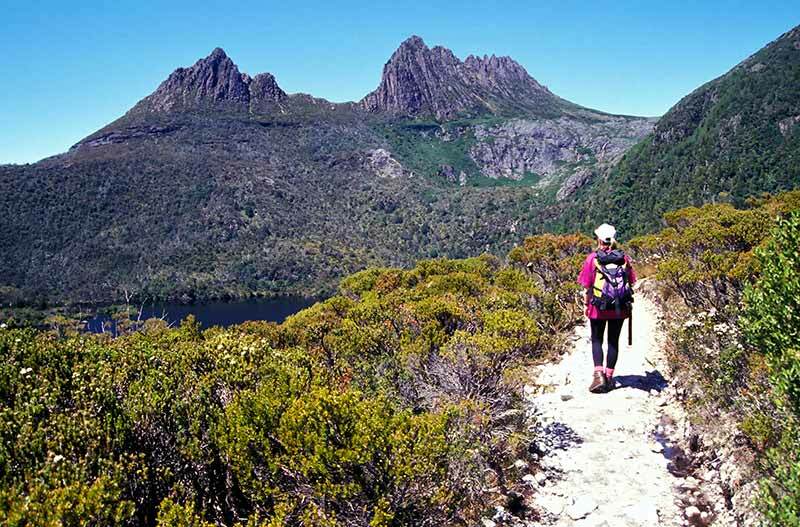 Over the years, the Cradle Mountain campground was moved out of the national park and the lodge expanded with luxury cabins, gourmet meals and prices that have regularly rocketed upwards. In 2015, we joined a portion of the 280,000 annual visitors and had to book a campsite well in advance. The visitor centre at Cradle offered a shuttle bus into the park in an effort to relieve the parking crisis. Walkers poured out of buses and 4WDs and what were once empty trails were now crowded. Cradle, Lake St. Clair, Mount Field, Port Arthur and everywhere else we went had been discovered and changed forever. In 2000 we did a year-long tour, then a three-year tour in 2005, then a two-year tour in 2015. With each there were changes, not surprising since Australia’s population had doubled since 1977, as has its affluence. Linda Lee Rathbun and Steven David Miller travel in an Ultimate camper trailer nowadays. We had begun our touring life in a tent and rented campervans, then a couple of camper trailers, then a caravan followed by a bigger caravan. Our most recent tour saw us back in a camper trailer, an Ultimate, in an effort to get away from the growing crowds. That worked, for a while, until everyone else decided to join us offroad. The Kimberley used to be the back of beyond, now it is simply beyond belief. Travelling used to allow for total spontaneity: arrive when and where you please and stay as long as you like. Now, you better book in advance and know how long you want to stay, otherwise you are likely to miss out on that favourite campground. Show me a full-time traveller and I’ll show you someone cringing at the next school holiday for fear they won’t find a place to stay. Free campsites? Better be there by 11am to snap up a spot before they are all gone. You still meet some great people travelling, but to a degree they keep to themselves more than before, perhaps trying to maintain a private space in those caravan parks that cynically squash campers in to the point your awning is touching the van next door and your vehicle barely fits anywhere. Don’t get me wrong, it is still a great lifestyle and a great holiday for families. However, we look back on those early years with nostalgia and gratitude that we were able to do it before so many others took it up. You can never go back to what it was; for us, we’re just glad we were there back then. Thomas Wolfe said, “you can’t go home again.” Although touring Australia isn’t like it used to be, there are still many unique experiences to be had as long as you don’t mind sharing them with others – lots of others! I suggest you go now because it’s unlikely to change for the better in the future!